Screen printing and direct-to-garment printing are two very different ways to print custom designs onto t-shirts and other garments. It will be one method or the other depending on your needs, and you should understand the pros and cons of each method before you make your decision. What is the size of your order? Are you printing a simple design with one color or a complex design with lots of colors? Do you want dark prints on light shirts or vice versa? By understanding the pros and cons and asking yourself relevant questions like these, it should be easy to choose the right process. Screen printing (also known as silkscreen) is the most common printing method with clothing, and it is popular with hobbyists and commercial providers alike. With this printing method, you create a stencil by exposing photo emulsion sheets, and then you create the printed garment by applying ink over the stencil. This method is versatile and effective, and when done properly it can deliver great quality results that last for a long time. Screen printing is also very cost effective when dealing with bulk orders because the price gets lower as the quantity goes up. Film processing is not the only way to make screen stencils, and it is easy enough to set up a screen printing rig at home with materials from crafts and artistry stores. If you are careful with your method you can achieve surprisingly good results with little more than mesh fabric and blocking paint. The most significant downside to screen printing is order limitations. For screen printing to be effective (apparatus and inks cost money, and setting up the design takes a fair amount of time) there needs to be a minimum order size. This is not a cost-effective process unless you buy in bulk. This printing method is exactly what it sounds like. The process is very similar to printing on paper with your inkjet at home; only the printer is much more advanced and uses special ink. Direct to garment printing comes with a number of advantages, and the two main advantages are speed and simplicity. Because garments are printed directly onto with an advanced inkjet printing process, there is very little that the printing person actually needs to do. This is unlike screen printing, which requires lots of skill and “hands on” involvement. As a non-contact process, DTG reduces human error and allows for more accurate results (when the printer is properly used and calibrated), and results can be superior to any other type of inkjet printer. Because DTG prints essentially whatever you want from a digital file, the potential for custom designs and colors is quite excellent. Here you can achieve as much detail and intricacy as you’d like, and you can play around with designs without having to constantly go through the motions as with screen printing. With easy setup, this method is often best for small custom garment printing orders. DTG has a few disadvantages. Machines are an investment, inks are expensive, and equipment maintenance is an ongoing commitment. While the process is becoming more advanced, results are still quite limited when you print light colors onto dark fabrics. Cost-wise, silk screen printing can be more cost-effective, but if you’re printing only a few dozen full color images, DTG is ideal. 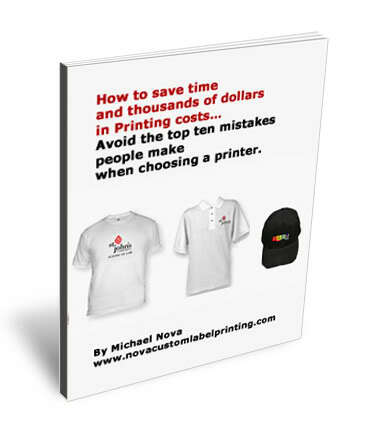 If you are printing up to six colors on six dozen or more shirts, screen printing is a good choice. If you need full color images with unlimited colors, go for DTG printing. Of course, for the customer there is one very important factor that has not been approached, and that is choosing the right printing company. Either of these printing methods can lead to excellent or disappointing results depending on the quality of the machinery and the skill of the printing staff (this is especially the case for screen printing). So get informed and decide on the right process, but choose wisely when it comes to selecting the right company for your printing needs. Make sure they have reliable clientele, and have been in business for many years.